› Home › Browse Ecoprojects › Funded Ecoprojects › Stop nylon fishing nets! A polluted ocean where thousands of fish die: due to lost nylon fishing nets this nightmare has become a real time catastrophe for the marine ecosystem. Monofilament nylon nets are cast in zones attractive to fish. Unfortunately, when they get caught on rocks or on sea bottoms, they can no longer be used and fishermen are forced to abandon them. Fish caught in them die uselessly, attracting other larger predators that also get trapped. Since we know that these nets take about 400 years to disintegrate completely, we can imagine the consequence of this ecological disaster (loss of fish species and pollution of waters), which might be otherwise avoided. Badou Kane and l’Océanium de Dakar don’t want surrender in front of this catastrophe vision. From the 1st to 31st of Mai 2013, they organize sea outings, twice daily, with 16 French volunteer professional and many amateur divers from Senegal. Together they will pull lost nets from the site within the Dakar region: Goree Island, National Parc of Madeleines, Bay of Dakar, Mbao, Hann, Rufisque, Kayar, Ngor Island and Mbour. Though banned by the Senegalese fishing code (article 30), they are still illegally used artisanal fishers because of their investment already made in nylon nets but also because of the lack of information and sensitization of the fishermen and the authorities about the ecological disaster. Therefore, ridding the sea of nylon nets is great but making sure fishermen use biodegradable cotton nets is even more important. That’s why in the neighborhoods and villages where fishermen live, Oceanium will organize public viewing of films on the negative effect of the nylon nets to the marine ecosystem, followed by public forums. The overall objective is to launch a nation-wide dialogue about the illegal use of the nylon fishing nets, in order to find solutions for an artisanal sustainable fishery in Senegal but also in the sub region. The campaign has the support from the Senegalese Ministry of Environment, from the Sea Shepherd, from the PADI, FIBA and Surfrider Foundations. Badou Kane, a well-respected fisher of the Mbour community used to fish with nylon nets. Since he has realized the disastrous consequences of nylon nets he pursues artisanal fishing with biodegradable cotton nets. For years he has been engaged in protecting the sea, which represents his passion and his livelihood, from environmental destruction. He is now engaged to change the habits of his own fishing community in Mbour. Your donation allows Badou Kane and the Oceanuim to clean the area of Mbour. The coast of Mbour is mostly a muddy seabed, but around the rare rocky reef you can find an abundant faune which finds its refuge there, such as invertebras, benthos and many fish such as the sea bream and the sargo. Off shore of Mbour you can find the kunk “Allemagne”, a wreck where the nets have been known to get stuck. It is a first that in this zone, because of Badou Kane’s engagement, the fishers committed to no longer fish the targeted sites. In order to clean the area of Mbour, the 12 voluntary French divers will have to dive 2 times per day for 2 days. The cost of one diver per day (food and beverages, accommodation, fuel for 2 boat trips) comes up to 24.000 FCFA or 37 euros. On top of this are the costs of the car rental to transport the divers and their equipment from Dakar (Oceanium) to Mbour. 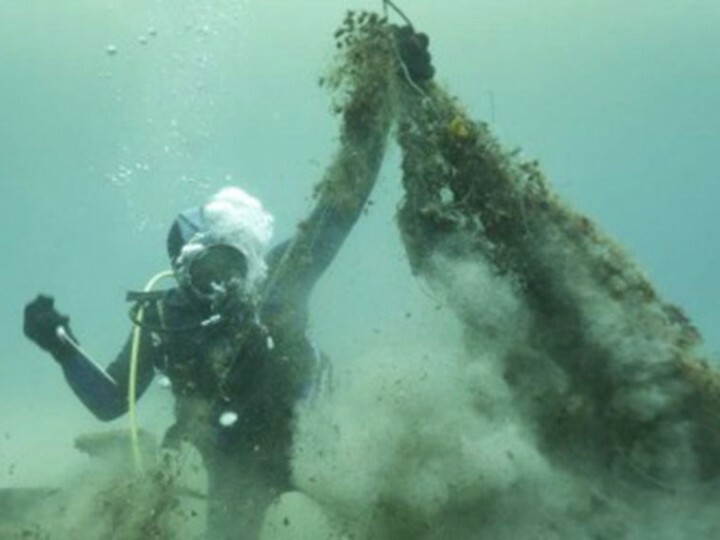 With only 50 euros, you can pay the expenses that one diver has during one day of cleaning. We need 12 divers for 2 days. Ready, set,…! If your donations exceed the sum of 1200 euros needed for the cleaning of the Mbour ocean site, it will serve to finance the other sites that will be cleaned around Dakar. Ecopartner for Stop nylon fishing nets! Last Monday, together with our Ecopartner, Oceanium, with the Project Champion, the fisher Badou Kane, with the Project Sponsors, Mrs Bierhaus, COTOA, ONOMO and Eiffage Senegal, we celebrated the closing of the 2013 edition of the ocean cleaning operation “Stop nylon fishing nets”. According to the divers participating benevolent in the operation, compared to the last year operation, this year there were less nylon fishing nets found. Furthermore, the involvement of the population, especially on the project site in Mbour, was high. This is a sign of a small but steady success of the cleaning and sensitization, in particular thanks to our champion Badou Kane. Shure, we did not resolve the problem of the lost nylon fishing nets. And more and continues action is still needed, in particular concerning the enforcement of the law banning the commercialization and utilization of the nylon fishing nets. But the progress is positive and tangible, which is important for the champion, Oceanium and our Ecofund Community. Let’s continue our efforts. During the ceremony, together with our ecopartner, Oceanium, will rewarded the project donors, Mrs Bierhaus, COTOA, Eiffage Senegal and ONOMO wit “Diploma of Ecofunders” signed by president of Oceanium and the Senegalese Minister of Environment and Sustainable Development, Haidar El Ali. The event also hosted the inauguration of the collective art exhibition “Sunu Gueidj” (Our Ocean) under the presence of the artist THIA. See below the recycling of the ecological disaster, nylon fishing nets transformed to “oeuvre d’art”: a huge ball representing our planet and its biodiversity caught in a trap. Many thanks to our Ecofund community for your support to the project. Many thanks to the corporate project partners: COTOA, @onomo and Eiffage Senegal. 27th of May 2013 at 5 p.m at Oceanium Dakar we will celebrate the closing for the project “Stop nylon fishing nets” . During the ceremony, the ecopartner of the project, the president of the Oceanium association and the Senegalese Minister of Environment and Sustainable Development, Haidar El Ali, will reward the project donors, Mrs Bierhaus, COTOA, Eiffage Senegal and ONOMO. The event will also host the inauguration of the collective art exhibition “Sunu Gueidj” (Our Ocean) under the presence of the artist THIA. 16.05.2013 › YES, we did it. Thank you, Ecofund Community! Following COTOA the hotel ONOMO in Dakar and Eiffage Senegal have contributed to the successful fundraising for the two Ecoprojects: “Stop nylon fishing nets” and “Nature Geniuses”. This is a very good example of the collaboration between between civil society and the private sector for the protection of our environment. COTOA has been the first Senegalese firm to support the Ecoproject “Stop nylon fishing nets”. Compagnie Textile de l'Ouest Africain, COTOA specialises among others in the distribution of fishing material. When COTOA learned about the ecological disaster caused by nylon fishing nets, the firm has abandoned the commercialization of these nets and supported the new law banning nylon fisher nets. Nonetheless, when we presented the Ecoproject “Stop nylon fishing nets” to the CEO of COTOA, Mr Theron, he wasn’t convinced. “Ridding the sea of nylon nets is great … but making sure fishermen use biodegradable cotton nets is even more important” he said. It’s the Ecofund approach based on concrete action initiated by a local champion, which finally convinced him to support the Ecoproject. Badou Kane, the champion of the Ecoproject, is a well-respected fisher of the Mbour community who used to fish with nylon nets. Today, he abandoned nylon fishing nets for biodegradable cotton nets. He is now engaged with Oceanium to change the habits of his fishing community in Mbour. The collaboration between Bado Kane, Oceanium and COTOA is a partnership between civil society and the private sector for the protection of our environment. This partnership is a perfect example of the private sector RSE Senegal initiative, and it’s only a beginning! Ecofund signed on May 2nd a partnership agreement with RSE Senegal. Compagnie Textile de l'Ouest Africain, COTOA has been the first Senegalese firm to support the Ecoproject “Stop nylon fishing nets”. Help our champion, Badou Kane, and Oceanium to recover lost nylon nets from the ocean next to the fishers’ community of Mbour.